Can The Bible Become An Idol? 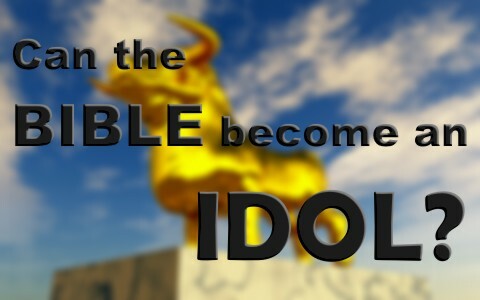 The question might seem ridiculous at first but can the Bible actually become an idol? The answer might surprise you. Idolatry is the worship of anything or anyone, regardless of what it is. Some people worship money by investing their whole life into pursuing it. Some people make their job or position in life the idol of their life and in a sense, worshiping money or the position in which they find themselves. In ancient times, nations sometimes worshiped a manmade image like a stone figure or carving. Some even made sacrifices to these images, going so far as to sacrifice their own children in the fire. Idolatry is actually worshiping anything or anyone other than the one true God. This is breaking at least two commandments, the first and the second; “You shall have no other gods before me” and “You shall not make for yourself a carved image, or any likeness of anything that is in heaven above, or that is in the earth beneath, or that is in the water under the earth. You shall not bow down to them or serve them, for I the Lord your God am a jealous God, visiting the iniquity of the fathers on the children to the third and the fourth generation of those who hate me, but showing steadfast love to thousands of those who love me and keep my commandments” (Ex 20:3-6). Today, there is still idolatry occurring in our society. It may not be worshiping a carved image or icon but we worship whatever we love the most. God declares that the “word is a lamp to my feet and a light to my path” (Psalm 119:105) and so it is. It illuminates our path in life and shows us the way in which we should go and the ways we should avoid. The Word is also like a double-edged sword for it “is living and active, sharper than any two-edged sword, piercing to the division of soul and of spirit, of joints and of marrow, and discerning the thoughts and intentions of the heart” (Heb 4:12) but all too often, Christians take up the sword, which is the Word of God, and use it to attack one another over what they believe it means. How sad that the Word that God gave us to help us grow and actually brought us into saving faith (Rom 1:16) is sometimes used to battle with other believers over what we think it means to us. This surely grieves the heart of God because the Word was never intended to be used like this. When Christians take texts and throw them at one another like spears, we are using the Word in ways that are unbiblical. The truth is that Scripture should be used to interpret Scripture and not by human reasoning or logic. God gives us the Word of God and the Spirit of God to make the children of God and His children are not supposed to fight among themselves using the Word. As I mentioned in the paragraph above, too many Christians take verses out of context and make it a pretext or use it as proof text to build their own set of beliefs by it. This is nothing short of idolatry. Instead of worshiping a graven image we worship our favorite texts and use them to create doctrines. This always turns out badly because text must always be read within the context of the whole chapter and even the book. God never intended to have us use one text to build a belief system on it. It takes the whole Word to get the whole counsel of God. The only thing we might not do is bow down and worship the Bible but when we idolize certain verses over and against other verses or people, we are creating a god in our own likeness and a Bible of our own beliefs. It is just as idolatrous as the times when Israel fell down and worshiped Baal. They might not think they’re making the verse or even the Bible an idol, but they show that they are by the way that they react to it and by the way they treat others when they don’t believe as they do. What they believe they expect others to believe and when they don’t, they accuse them of calling God a liar or the Bible as being wrong. I actually heard one man at our Bible study say this; “either you are wrong or the Bible is and you are calling God a liar.” That put this other man in an impossible situation from where he had no way out. I corrected this man for putting this other man in such a predicament. I told him you can’t beat other people over the head with your particular verses or by using the Bible. I said that it’s like idolatry of the Bible or certain scriptures. This is one of the most sinful things that we can do because then we are judging others and condemning them by our words because they don’t believe the way that we do. I have had some people even go so far as to say that the translation that they are using is demonic and is the translation of Satan. That’s also very condemning too since we don’t have the original manuscripts. There are some words from the Hebrew, Greek, or Aramaic that we can’t translate because there’s no equivalency to it in the English. Some say the NIV is evil because of who publishes it. Others say the King James Version is the only one, true translation there is and that others are from the Devil or at best, are corrupt. That astounds me because why would Satan want us to use the Bible in the first place? Yes, some translations are more accurate. I like the King James Version, the New King James Version, the ESV and the NASB but to condemn others for the translation that they use is to make their own personal Bible their own idol and we must all bow down to it and only read it and if we don’t, we’re condemned. Like anything else in this world, we can even make the Bible an idol.We might not come out and say it but we can make our own translation or our verse into a god that must be worshiped and those who don’t are judged to be in sin.There are enough idols in the world without having to make one of the Bible. We worship God and Him alone; all else is idolatry. ESV Resource – Scripture quotations are from The Holy Bible, English Standard Version® (ESV®), copyright © 2001 by Crossway, a publishing ministry of Good News Publishers. Used by permission. All rights reserved. This is a great topic, thank you for bringing it to our attention pastor Jack! I couldn’t find a place to post a comment on that page. With choosing a study Bible, how do we know how knowledgeable the commentator(s) are? If we found a biased commentator, or one that wasn’t knowledgeable, that could have an adverse effect on us while reading the study section. It would be great to have guidance on choosing a study Bible. Thank you for sharing your insight with us, and cautioning us in our actions and thoughts. Thank you my brother. I believe the cross can become an idol too in my opinion. You are always the great encourager my brother. I think the two most trustworthy Bible’s with commentaries are the ESV’s Mac Arthur Study Bible and the Reformation Study Bible with editor R.C. Sprouls. Thank you for sharing some ideas on Study Bibles. I will look in to both of them. What we can make an idol is basically that what we want to believe. And then try to claim the Bible doesnt really say what it says. The word says what it says. And the word is God. God is God as in Jesus Christ (John 1:1-4) and God is not an idol, I agree. we should worship God and worship Jesus Christ Who is very God! Next post: What Does Propitiation Mean?